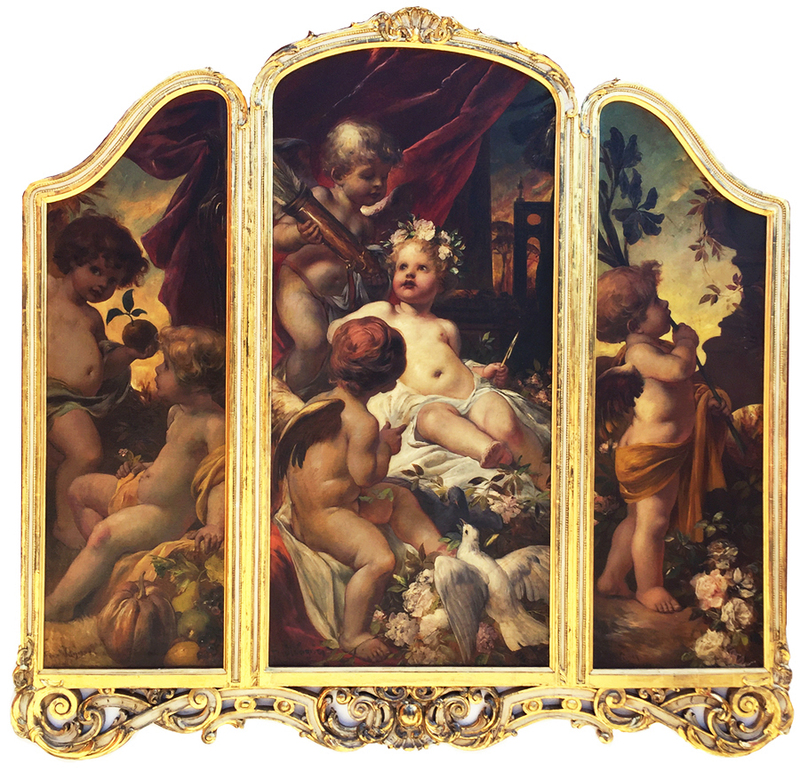 Ferdinand Wagner II (German, 1847-1927) A Very Fine and Charming Triptych Group of Three Oil on Canvas Laid on Board Titled "An Allegory to Spring" each panel depicting different playful and joyous scenes of putti and a cherubs reminiscent of Spring, Love and Peace. The center panel depicting a seated putto, crowned with flowers, a standing putto behind him holding a sack of arrows and a seated cherub facing him next to a watchful peace dove on top resting of a flower bouquet. 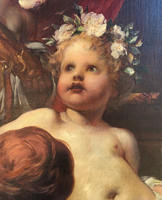 The left panel depicting a seated putto next to a standing putto with a freshly harvested apple. The right side panel depicting a standing cherub holding a fig branches with leaves. All three-in-one panels within individually carved gilt wood frames. All panels signed at the lower left: Ferd. Wagner. Circa: 1890. Ferdinand Wagner II (German, 1847-1927) was the son of Passau Ferdinand Wagner Senior, a teacher at a vocational art school who began training him professionally at a young age. After traveling to Italy in 1867-1868, he continued with his art studies at The Munich Academy of Arts led by Peter Von Cornelius and Julius Schnorr Von Carolsfeld. Wagner II was influenced by the Munich school of master painters and by his art teacher, Karl von Piloty, who had been teaching at the Munich Art Academy since 1856. Piloty’s approach to historical paintings was influenced by the French art academic Paul Delaroche and by the fine artworks by Rubens and the Venetians. After his return to Germany he was commissioned to decorate the former the Tenormayer Wine Tavern in Munich, subsequently he received numerous other commissions as a decorator. Ferdinand Wagner II wall paintings and ceiling frescos attracted the attention from the Munich City Hall and he was commissioned to decorate the cellar and at the German Theatre. He also decorated the dining room at The Drachenburg in the Königswinter on the Rhine, the Café of Roth and Luitpold in Munich and The Tivoli Restaurant in London. Between 1890 and 1891 he was comissioned numerous art works for the "Prince Bismarck" Steamboat. In Passau he created works at the town's City Hall. Between 1892 and 1916 he worked continuously decorating the Castle Ratibor by Roth where in 1894 he painted it's main artwork "The Triumph of Aphrodite". Amongst other works, in 1891 he decorated the facade at The Schwyz City Hall, in 1895 the Grand Hall ceiling fresco at the Castle Bueckeburg's, in 1897 the decoration of the large dining hall at the Famous Munich Hofbräuhaus and in 1899 he was commissioned to decorate the tower hall of the newly built Hamburg City Hall. In Passau, Ferdinand Wagner II was awarded numerous honors where, in 1887, he was named an Honorary Citizen, the Ferdinand-Wagner-Straße Street was named after him and the "Ferdinand Wagner Hall" at the Town's City Hall was named after him as well. Source: Wikipedia. Ferdinand Wagner II (German, 1847-1927) A Very Fine and Charming Triptych Group of Three Oil on Canvas Laid on Board Titled "An Allegory to Spring" each panel depicting different playful and joyous scenes of putti and a cherubs reminiscent of Spring, Love and Peace. The center panel depicting a seated putto, crowned with flowers, a standing putto behind him holding a sack of arrows and a seated cherub facing him next to a watchful peace dove on top resting of a flower bouquet. The left panel depicting a seated putto next to a standing putto with a freshly harvested apple. The right side panel depicting a standing cherub holding a fig branches with leaves. All three-in-one panels within individually carved gilt wood frames. All panels signed at the lower left: Ferd. Wagner. Circa: 1890. Ferdinand Wagner II (German, 1847-1927) was the son of Passau Ferdinand Wagner Senior, a teacher at a vocational art school who began training him professionally at a young age. After traveling to Italy in 1867-1868, he continued with his art studies at The Munich Academy of Arts led by Peter Von Cornelius and Julius Schnorr Von Carolsfeld. Wagner II was influenced by the Munich school of master painters and by his art teacher, Karl von Piloty, who had been teaching at the Munich Art Academy since 1856. Piloty’s approach to historical paintings was influenced by the French art academic Paul Delaroche and by the fine artworks by Rubens and the Venetians. After his return to Germany he was commissioned to decorate the former the Tenormayer Wine Tavern in Munich, subsequently he received numerous other commissions as a decorator. Ferdinand Wagner II wall paintings and ceiling frescos attracted the attention from the Munich City Hall and he was commissioned to decorate the cellar and at the German Theatre. He also decorated the dining room at The Drachenburg in the Königswinter on the Rhine, the Café of Roth and Luitpold in Munich and The Tivoli Restaurant in London. Between 1890 and 1891 he was comissioned numerous art works for the "Prince Bismarck" Steamboat. In Passau he created works at the town's City Hall. Between 1892 and 1916 he worked continuously decorating the Castle Ratibor by Roth where in 1894 he painted it's main artwork "The Triumph of Aphrodite". Amongst other works, in 1891 he decorated the facade at The Schwyz City Hall, in 1895 the Grand Hall ceiling fresco at the Castle Bueckeburg's, in 1897 the decoration of the large dining hall at the Famous Munich Hofbräuhaus and in 1899 he was commissioned to decorate the tower hall of the newly built Hamburg City Hall. In Passau, Ferdinand Wagner II was awarded numerous honors where, in 1887, he was named an Honorary Citizen, the Ferdinand-Wagner-Straße Street was named after him and the "Ferdinand Wagner Hall" at the Town's City Hall was named after him as well. Click here to view a previously offered and sold quadriptych oil on canvas group, also titled "An Allegory to Spring".